Where will I sleep while on the Mountain? Where Will I Sleep While on the climb? Unless you select to climb the Marangu Route, which uses wooden huts as shelters, you’ll spend your nights sleeping in a tent as you make your way up Kilimanjaro. 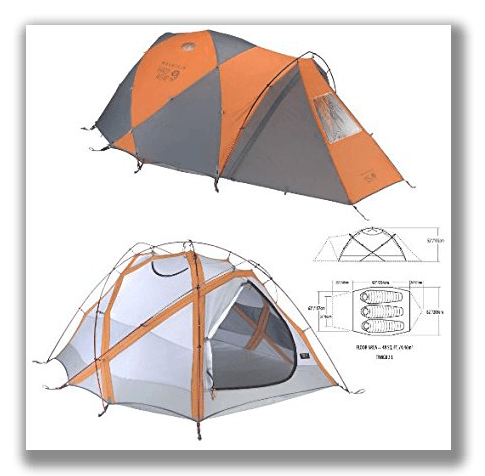 The tents we use on our treks are Mountain hardware brand 4 season tents. They are spacious, comfortable, waterproof. and designed for use in alpine settings like those found on the mountain. Over the course of your hike, it will become your home away from home, and most trekkers find the tents to be a nice refuge after a long day on the trail. To make your trek more comfortable, be sure to pack a warm sleeping bag (we recommend a 0ºF/-18ºC model) and a sleeping pad. The bag will provide warmth, even as you go higher up the mountain, while the pad will help keep you off the hard ground, which in turn provides a better night sleep. If you don’t have a sleeping bag or sleeping pad at your disposal, be sure to let us know. We have both available to rent. The tents we use on are Kilimanjaro climbs were chosen to provide plenty of room for two trekkers, plus their gear. This makes it easier to sort through the clothing you’ll need for the next day’s hike, while giving you enough space to be comfortable when just lounging inside or getting some much needed sleep. If you are not accustomed to sleeping in a tent, we would recommend bringing a pair of ear plugs to help drown out external sounds. High winds can make it difficult to sleep at times, while noises from your tent-mate or the campsite in general can cause some some climbers to have a difficult time sleeping too. It is also nice to have a music player and a set of earbuds to help you relax while resting in your tent as well. Rest assured that our tents are perfectly suited for use on the mountain and will be a great place to relax following a long day of hiking. When you arrive at our campsite each afternoon, your tent will already be constructed and waiting for you. We hope you come to appreciate your own little private sanctuary while on the mountain. You can also follow this link to read more about Kilimanjaro climbing gear list.